Water filtration at home is necessary to remove trace levels of chemicals and micro-organisms that remain in the water. Look for refrigerator water filters that filter water in several stages and filter several thousand gallons of water before needing replacement. Have your water tested to identify specific contaminants so that you know what to look for in a filter. You don’t want to purchase a water filter that does not remove the contaminants in your drinking water. 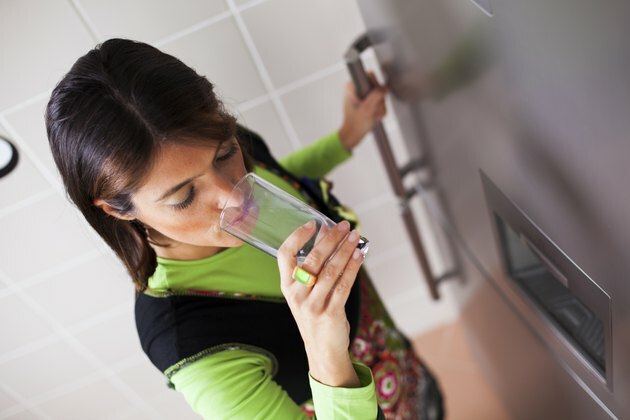 If you have specific water contaminant concerns, such as fluoride or arsenic, there are refrigerator filters that can remove these elements from the drinking water. Refrigerator water filters are sold online and at home improvement and appliance stores. Stores that sell refrigerators, such as Sears, Best Buy and Lowe's, generally will carry appliance parts, including the replacement filters. Refrigerator water filters also are sold on many retail websites, as well as Amazon. The cost of the filter depends on the model of the refrigerator. The cost generally ranges from $30 to $120. The prices vary according to the amount of gallons a filter filters and its filtering specifications. Lower-end refrigerator filters remove basic common contaminants such as chlorine, volatile organic compounds (VOCs), lead and microorganisms, while higher-end filters also may remove arsenic or fluoride. Some of Best Buy’s best-selling filters are the Samsung Replacement Water Filter for Samsung side-by-side units, model number DA29-0003B. It sells for approximately $40. The Whirlpool PUR Refrigerator Water Filter, model number 4396841, for Whirlpool models, also retails for about $40. Sears' top-rated water filters include the Kenmore Base Grille Water Filter, model number 9915, which retails for about $40, and the Maytag Water Filter Cartridge, model number UKF7003AXX, for Maytag and Jenn-Air side-by-side models, which retails for $50. Only purchase new, genuine refrigerator water filters that are specified for your refrigerator model. This doesn't mean, however, that you have to purchase it directly from the manufacturer. Look for models at a local home improvement or appliance store. You may even find the same filter sold at an online store at a fraction of the cost you would pay directly from the manufacturer.